People like patterns. When we see a pattern, we can generally figure out what comes next. Scientists have been classifying sunspots for many years and in many ways. 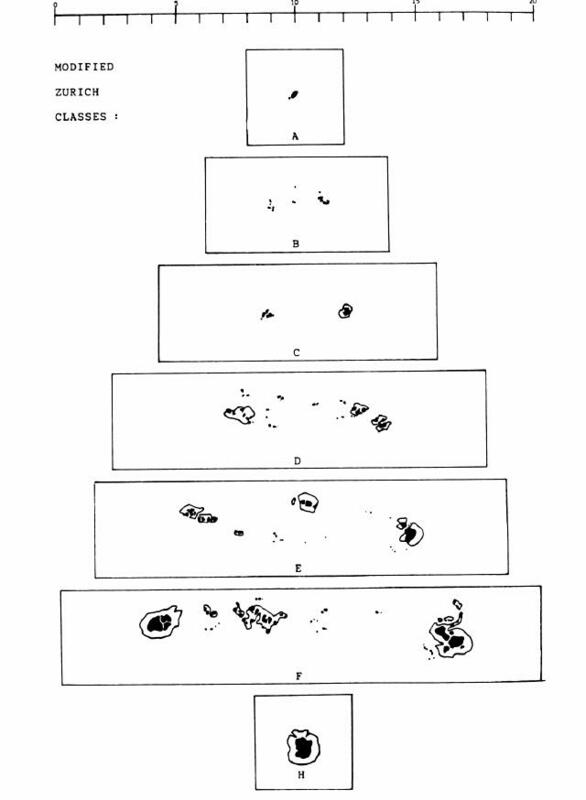 One method of classification, the Zürich Method of Sunspot Classification, was devised in 1938 by M. Waldmeier. 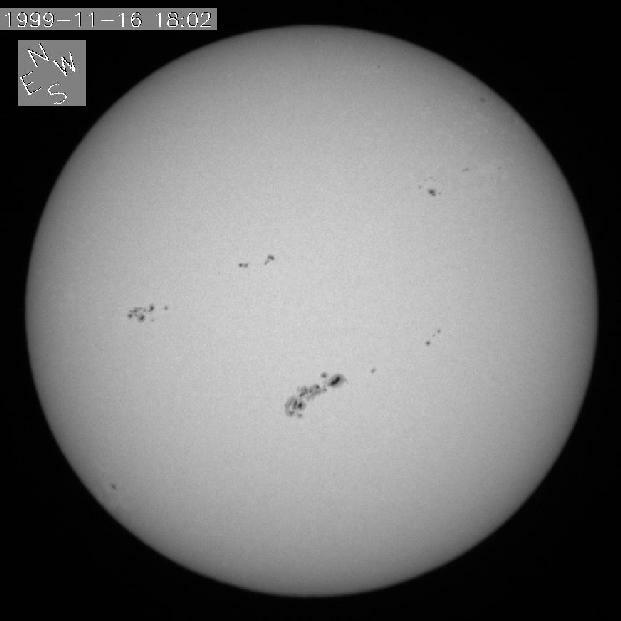 In this activity, you will use a modified version of the Zürich Method to classify sunspots. A single spot or a single compact cluster of spots with the greatest distance between two spots of the cluster not exceeding three heliographic degrees. Two spots or a cluster of many spots extending roughly east-west with the major axis exceeding a length of three heliographic degrees. Look at the sunspots below. Outline the penumbra of each spot in green. Outline the umbra of each spot in red. Look at these sunspots. Use the scale provided with each image to estimate the size of each sunspot group. The diameter of the Earth is approximately 1.28 x 104 km. Draw a scale image of the Earth in the lower right-hand corner of each of the above images. Look at this white light solar image from Big Bear Solar Observatory in California taken on November 16, 1999. There are several neat sunspots and sunspot groups in this image. How do scientists classify all of these sunspots? Today, scientists use a combination of visual and magnetic characteristics. Take a look at the following table. It�s a classification scheme you can use to classify sunspots and sunspot groups, based on their visual appearance. After you have looked at the previous description and pictures of sunspot classes, try classifying the sunspots and sunspot groups on the following solar image, an active region map from Mees Solar Observatory in Hawaii. The data for this image were obtained on the same date as the white light image you viewed above. For this type of map, sunspot data are collected and plotted on a Stonyhurst grid. Notice that each sunspot or sunspot group is given an official number (by the National Oceanic and Atmospheric Administration, NOAA) and location. Also notice that there�s more data on the page than you need (the LO, Area, Z, LL, NN, and Mag TYPE). The latitude and longitude lines on this map are spaced at 10° intervals. Use the information from the BBSO image, the modified Zürich Classifications, and the examples of modified classes, to classify each sunspot group called out in the table below. Compare your results to the actual classifications to see how well your spot classes measure up. Your teacher will give you the correct classifications.